When judges take up office, there is usually a ceremonial “swearing in” ceremony. When judges retire, there is sometimes a ceremonial sitting with valedictory speeches. The full title to this little snippet of transcript (found on the notice board at my workplace) is “The Naughton DCJ swearing out ceremony.” Judge Naughton of the District Court of NSW retired on 16 February 2007. I think you can safely assume that Mr McQuillan was not a legal practitioner, but a litigant-in-person. This is a further post in my series provoked by objects found whilst going through my too-many boxes of junk in an attempt to cull them. In primary school and year 7 in NSW, we all studied “Social Studies,” now I think replaced by “Studies of Society and the Environment,” (SOSE for short). In year 7, for some reason, the syllabus focussed on ancient civilizations. Our teacher, Mr Yeo, had just completed an honours thesis on the reception of Darwin’s theories, and he lent me a book on this. This led me to get hold of a copy of The Origin of Species (or maybe it was The Descent of Man). I never managed to get far with the Darwin, but I think it says something of the attitudes of even a (relatively) enlightened clergyman to the theory of evolution that the school chaplain, who took us for “Divinity”, evidently (and possibly rightly) considered my placing the book on my desk as an act of mild defiance, which many years later he even referred to in his history of the school. You can tell he was new. 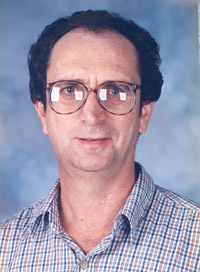 Mr Yeo is now Professor Richard Yeo at Griffith University. You will see he still has his hair, which, sadly, is more than I can say for myself. This is the second in a series. Having disposed of a few boxes of books, I am now tackling other boxes, which are disclosing various objets retrouvés. 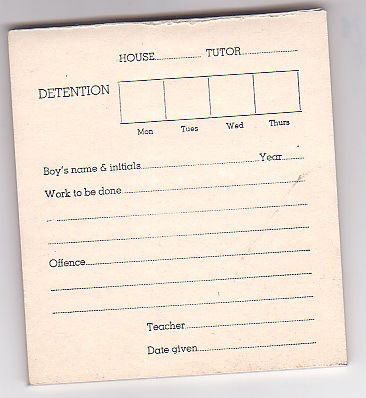 When I started teaching, the school had a system for the administration of “after school detentions.” To describe the system from the teacher’s point of view, you filled in a form (in duplicate from a printed notepad) like the one above. You gave the boy one copy, and put the other into a box for the relevant day of the week. This meant that, instead of detaining the boy yourself or asking him to come and see you at some time after class (when he may or may not turn up), the boy was required to present himself at the appointed time and classroom where he was “detained” for an hour (nominally that is: it usually lasted a little less than that) and do the designated “work” (a version of the classical “imposition”) which he then handed in and which was duly returned to you. If the boy did not show for the detention, he ran the risk of being given a “Friday detention” which lasted for two hours rather than one. At one stage, these detentions had been held on Saturdays, which was a much more onerous punishment). A record was also kept of detentions given, as well as a stamp in the boy’s “home lesson diary” (which boys were required to have signed by a parent every week and present for inspection by their tutors), and this information also went to the boy’s “housemaster” (the name originates from boarding houses in English public schools) and the number of detentions received also appeared on his school report. 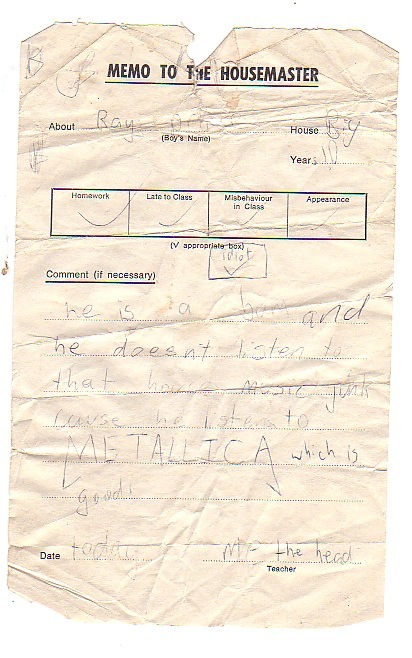 The school ran on forms. Every lesson we also had to mark the roll and fill out a form showing who was absent (called an “absentee slip”) and hang it on a little hook behind the door. About 5 or 10 minutes into the lesson, these slips were collected by boys and collated and duly checked off against the school’s list of notified absentees (if a boy was to be absent, a parent had to either notify the school in advance and seek leave for the boy or, if he was sick, ring up on the first morning and write an “absentee note” for the boy to bring to school when he recovered). To be an absentee boy was a coveted role, a bit like being a trusty in a prison, since it entailed the vital privilege of running around the school out of class for 10 -15 minutes (it could always be stretched out) at the beginning of each lesson. This job was assigned on a rotating basis, but almost invariably the boys were in the academically lower grades of year 10. There were two further problems with the system. First, hardened offenders would be booked up for weeks in advance. 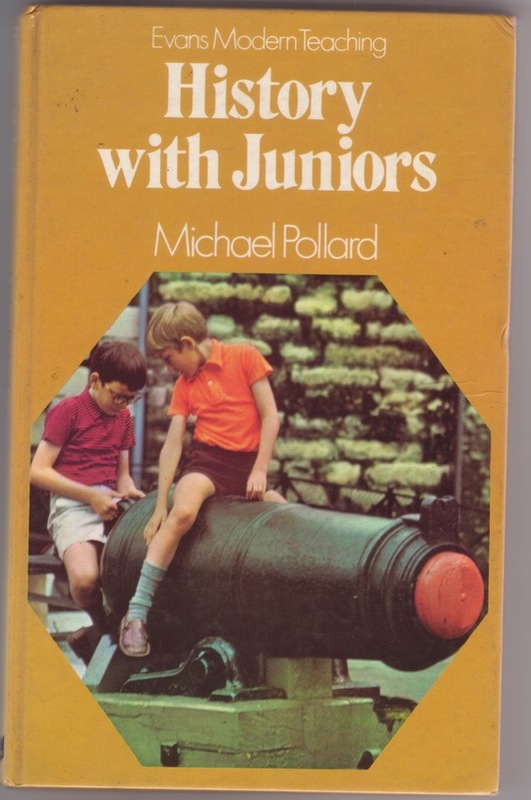 You weren’t allowed to give them a detention on an afternoon when they had other school commitments, so there would be the invidious position of negotiating with the supposed punishee for a spot in his already crowded diary. Secondly, the detentions themselves, presided over by a teacher with a well-developed gallows style of humour, gradually acquired a kind of cult following, particularly amongst the regulars whom you would see lined up outside the room afternoon after afternoon. This was associated with a kind of inflation of dishonours which was robbing the punishment of its power to strike fear into students and hence its punitive signification. In a kind of feed back loop, more and more detentions were being given, to less and less effect. One classroom was sometimes not enough to accommodate all the miscreants. In a radical move, after school detentions were abolished. They were replaced by a system of “referrals” to housemasters, who were supposed to admonish the students and monitor their disciplinary infractions across the board. Overall this change did not lead to any “law and order crisis” in the school, although perhaps there was a risk that some housemasters (yes, they were all men) were softer than others. I often think that there is lesson here for the criminal justice system and its own inflation of imprisonment terms and numbers: punitive symbolism and proportionality could be preserved by simply reducing all sentences by an across the board percentage. Hard cases could still be dealt with on an ad hoc basis. Of course there were forms for this as well. It is an ancient wheeze to get hold of some official form and fill it out satirically. This is one example I found at some stage and kept. At least I find it funny.